To loose some weight and become healthy, wealthy, and wise (well, maybe not the last 2) I've adopted an eating style that I call the First Century Diet. I didn't exactly invent it, as you'll see, but I've never found a book or article advocating it either -- possibly because it goes against the current wisdom that "breakfast is the most important meal of the day." Jack-in-the-Box, who I admire greatly, says that all the time but I have to part ways with him on this (By the way, best wishes for your complete recovery, Jack!). The First Century Diet is basically what it says: The way people ate in the mediterranean world during the first century (as well as long stretches of time on either side). Yes, Jesus would probably eaten pretty much like this, and according to The Mediterranean Diet Cookbook many people still do. I'm not doing it "eat what Jesus ate" and become holier thereby; I just want to slim down and it occurred to me that this might be an interesting way to do it. My information comes from many years of studying how people lived in biblical times. Two of the more accessible sources are the articles on "meals" in the International Standard Bible Encyclopedia and the Zondervan Pictorial Bible Encyclopedia. Or try this handy online source from the Catholic Church. During the first century the custom was to get up early and go straight to work -- without breakfast. To take the edge off your hunger you might grab a piece of bread or a piece of fish and eat it on the way, but breakfast as we think of it was unknown. You did your morning work on an essentially empty stomach and it was looked down upon to eat a big breakfast. That was something only the decadent rich did. Lunch was just a snack. People took some bread with them out into the fields, usually with some vegetables or fruit such as olives, onions, figs or dates. If you were a shepherd you might have a little cheese from the goats. Or you might bring along "a few small fish" as the Apostles did in Matthew's Gospel, chapter 15 verse 34, but they were probably dried and salted. Lunch was not a major meal though, just something to hold you through the rest of the day. The "big meal" was supper, which happened around sundown. This was a time for being with family and friends and lasted a couple of hours, like Italians do to this very day (according to that movie Under the Tuscan Sun, at least). But even supper was not a huge feast most of the time. For peasants the main course was normally some kind of stew -- usually vegetarian and eaten with yet more bread. 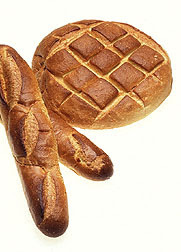 The bread was baked in round, flat loves and so could be folded like pita bread and used in place of a spoon. Unless you went out hunting, meat was a rarity, eaten only on special occasions. It cost money either to own a "fattened calf" like Abraham or to buy meat in the market. The First Book of Samuel (chapter 25 verse 18) shows what a well off lady could scrape together on a moment's notice. 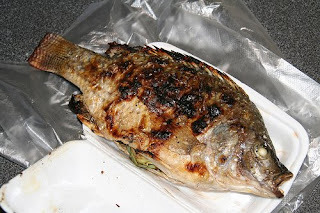 And as we know from the Gospels, people who lived near lakes and rivers ate broiled fish quite often (see John's Gospel 21.9 and the 24th chapter 42th verse of Luke's). 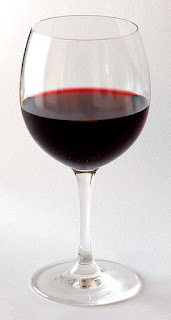 The prefered drink was wine but according to the Talmud this was cut with water 2 or 3:1. Again, you were considered a debauched party animal if you took it straight. Shepherds could have some goat milk, and of course water was the most common beverage of all. So how do I apply this to my 21st century lifestyle? Not in any fanatic, thoroughgoing way, I'm afraid but I am trying to get the gist of it. In the morning I have a cup of coffee with no sugar and just a dash of non-fat milk. If I get hungry before I leave for work I'll break off a chunk of bread just like those ancient Jewish farm laborers. At first I would substitute a quarter cup of oatmeal on the theory that it was about the same as a piece of bread -- and good for your cholesterol. But for whatever reason that just makes me hungrier, so now I stick with the bread. The bread, incidentally, is from a sour dough recipe in the Mediteranean Cookbook modified to be all whole wheat rather than mixed white and wheat. It sticks to my ribs much longer and is more nutrient dense. When I began eating this way I used whole wheat bread from the grocery. That worked fine but I would get hungry much sooner. Fortunately I have a wife who always wanted to be a pioneer woman and she makes 2 huge loves every week, like oversized french bread. We all eat from them; as big as they are I couldn't eat it all on my own. Since bread is at the center of this way to eat I'll publish the recipe in a later post. All through the morning I eat nothing else. I do drink a lot of water and another cup of coffee at work. My wife's homemade bread lasts me most of the morning -- sometimes all morning. But I frequently begin feeling hunger pangs around 10:30 or 11:00. The water and concentrating on my job help. After all, 1st century peasants -- living the poverty-stricken, precarious existance they did -- just had to keep working; their lives depended on it. For lunch I have to admit I just can't eat olives. I've always had an aversion to those things except in small doses (chopped up on pizza, for instance). But I do like olive oil. One evening a few years back at an Italian restaurant the waiter gave us bread as an appetizer with a bowl of olive oil and a little balsamic vinegar to dip it in. And frankly, it's delicious. So lunch for me is bread and the olive oil/balsamic vinegar mixture to dip it in. Dipping bread in olive oil was also an ancient middle eastern custom: it's probably what Jesus handed Judas just before he was betrayed. Figs and dates are too expensive while the aroma of fish (like anchovies, tuna, or salmon) irritates my fellow co-workers. So with my bread dipped in oil I imitate the shepherds and have cheese, ordinarily low-fat mozzerella "string cheese." This tastes good dipped in the oil too, I find. I wash all this down with iced tea sweetened with a packet of Splenda®. And a cookie for dessert. What? I said I wasn't a fanatic, didn't I? That lasts me the rest of the afternoon until I get home. And for dinner I just eat whatever Mrs. Pleonic gives me, along with a single glass of red hippie jug wine (nowadays called Paisano by Mr. Rossi) -- yes, diluted with water. How many calories this totals up to, whether the nutrients are balanced and such I have not bothered to find out. All I know is I feel basically full, more alert, and loose 1 to 2 pounds a week. The only downside I can see is that you could get sick of all that bread. The 1st century near-eastern peasant knew nothing else but you and I know there's a great wide world of taste treats out there. For me personally I think I can overcome that by varying the other item I bring for lunch; perhaps I can find some cheap figs. To avoid an extremely unlikly medical lawsuit, let me make it clear that I'm not a doctor, have no training in nutrition, and am not recommending that anybody eat this way; I'm just telling you what I do. But if you want to eat a lot of homemade bread and tell everyone at your next posh cocktail party that you're on this oh-so-cool First Century Diet you read about on AFewParagraphs.com, by all means you have my permission. Unknowingly, I lived off this diet for two years and lost quite a bit of weight. I think it was closer though to Mesopotamian times than jesus'. As a poor college student who would rather spend his money on beer, I would leave the house in the morning for school at 9pm and eat a biscuit, for lunch another bisquit, and then for supper (usually between 6pm and 9pm) the student staple of Kraft Dinner or perogies, I left the wine in the liquor mart for the classy people, I drank poverty-pack beer all the time, which gave me all the carbs I wasn't stocking up on. I lived off generic-brand mac and cheese all throughout my bachelor years. Still like it! The oil, I think, is the secret: it makes the bread greasy instead of dry. Butter or some other kind of oil works just as well. Another of my wife's cookbooks (not the Mediterranean one) talks about how people can't stand dry stuff for any length of time; we need what they call "mouth roundedness" -- i.e., greasiness. How I wish french fried stuff was good for me! Very interesting and amusing post! I see that you wrote this 4 years ago. How are things doing nowadays? Do you still continue to eat this way? I'm very interested in a first century diet, whether meat was a commodity or not. I'm starting to eat less meat, because I think it should be considered a luxury item in my diet. Sorry I took so long responding to your comment. But yeah, I pretty much still eat this way. The main change I've made is that I'm trying to get less sodium so my blood pressure doesn't go up. S, no "salted fish." Technically, what I'm eating now is the DASH diet (Dietary Approaches to Stop Hypertension) recommended by the National Institutes of health. But lo and behold it's basically the same as th "1st Century Diet" -- Lots of whole grains, vegetables, and fruit and much less dairy, meat, and sweets. I ought to post an update on this! I am 5 years behind on this but I am just now reading it and find it extremely useful in creating a personalized 1st Century Diet to follow - Thank You! I've been trying in recent months to return to Torah as my understanding of the faith has grown. I have not lead a very healthy lifestyle. I want to start eating as Yeshua ate as I try to live as he lived. A excecao e' chocolate de 85% sem acucar adicionado. post here at mmy residence. I am getting experience all the time by reading thes fastidious articles or reviews. Qual medida minimo para saque e quanto tempo demora. Thanks for finally writing about >"The First Century Diet" <Liked it! enjoyed reading it, you may be a great author.I will be sure to bookmark your blog and will eventually come back in the foreseeable future. Spot on with this write-up, I really believe that this site needs much more attention. I'll probably be back again to read through more, thanks for the info!